This has been true in the technology world for longer than most realize. Far longer. This was never more apparent to me than it was on August 11th, during Jeffrey Hammond of Forrester’s presentation at LinuxCon. Entitled “OSS Adoption Patterns In Enterprise IT,” it was data driven, solidly argued and professionally delivered – Hammond is an excellent speaker. What the presentation was not, at least from a RedMonk perspective, was news. Which is to be expected, I suppose, as Forrester is from Mars, RedMonk is from Venus. We see things that differently. The gist of the session comes in the text on slide 3: “When it comes to Enterprise IT adoption, Open Source Has ‘Crossed the Chasm’.” In support of this conclusion, Hammond employs a dizzying array of quantitative metrics derived from three surveys; two from Forrester (Enterprise And SMB Software Survey, North America And Europe, Q408/09 / Dr. Dobbs Developer Technographics Q309) and one from the Eclipse Foundation (2009/2010 Eclipse Community Survey). Besides the metrics, there are models (the software “iron triangle”) explaining mechanisms of OSS adoption, case studies of current users and best practices for would be users. While I might quibble with bits and pieces of the analysis, on balance it’s both thorough and excellent. My question is why it’s necessary. In a sense, this seems akin to the study proving that drugs and alcohol are bad for you: many of us accept the above as a given. Think big picture. Consider, for a moment, the component pieces of the venerable LAMP stack. Linux is the de facto alternative to Windows on the server and Apple in mobile, Apache is powering nearly sixty percent of the world’s websites, MySQL is the most popular relational database on the planet – important enough to hold up Oracle’s acquisition, and as for the dynamic languages, well, even Microsoft has been compelled to pimp them. Open source has so thoroughly transitioned to the mainstream, in fact, that some projects are exhibiting symptoms typical to mature businesses [coverage]. None of Linux, Apache, MySQL, or PHP rose to prominence because of CIOs, IT managers, or even analysts such as Hammond or myself. As the FAQ on RedMonk.com mentions, incidentally. Billy Marshall perhaps put it best when he said that the CIO is the last to know. The LAMP stack became popular because developers made it so. [Cloer]: You recently found that a new generation of developers is choosing to deploy web and enterprise apps on Linux. Why? Hammond: It comes down to barriers of adoption. As a developer you can download a LAMP stack or Spring and Tomcat and start work, or you can wrangle with purchasing for eight weeks and try to get the licenses you need. Developers generally don’t like spending time sitting on their hands waiting for purchasing agents to make them jump through hoops; they’d rather write code. Available Code: This isn’t necessarily about source code per se, although that’s related, but rather removing the barrier to entry for potential users of your application. I’m often asked what I believe to be the most critical success factor in projects such as JBoss or MySQL, and while the technical merits are important I believe that neither one of those projects would be where they are today without being freely downloadable. In competing with their commercial counterparts, JBoss and MySQL can differentiate simply by being easily obtained. When beginning a project, the choice is often download and get coding or head to procurement, and unsurprisingly the former is generally the preferred option. While this is certainly not a prerequisite for success, it’s a very effective means of encouraging participation in your particular community, because there’s no barrier to entry. When developers no longer need procurement, the process of technology adoption shifts fundamentally and, likely, permanently. This power shift is presumably part of what led Hammond to tell the audience “Congratulations, you’re on the winning team.” It is certainly, however, what led me to tell the developers at OSCON the same thing during my keynote in 2006 [PDF]. How did Forrester arrive at virtually the same conclusions we did, all these years later? It’s a function of the constituencies we each focus on, I suspect. RedMonk, remember, is from Venus. We are founded upon the idea that developers are the single most important constituency in technology. Open source dramatically lowers the barriers to adoption, such that developers may build upon what they want rather than what they’re given. There are exceptions, of course: Oracle’s continued success is but the most obvious. Red Hat, however, would not be a $750 million dollar business without the bottom up adoption of Linux. Google might not exist at all. This is the power of open source, and this has been clear to us for the better part of a decade. As far as we’re concerned, open source crossed the chasm years ago. We know this because the developers we track proved it to us. Forrester, being from Mars, is far more enterprise and CIO oriented, as are most of the large shops. Enterprises, understandably see the world through a different lens than developers. A mainstream role for open source is certain to be less of a fait accompli in the mind of the business than the individual. Particularly because those businesses are likely still unaware of the systemic usage of open source within their own organization. For that audience, this presentation is news. Which brings us back to Hammond’s deck. The statistical portion of the presentation consists of 14 slides, 6-19. Of these, seven – 6-9 and 12-14 – are entirely based on the Enterprise And SMB Software Survey study, while slide 11 is half that one and half a second Forrester survey. The remaining slides are half Eclipse data and half the second survey. What this means is that the Enterprise and SMB Software Survey represents the majority of the quantitative data used in the presentation. What audience does that survey represent? “Primarily Directors, VP App Dev, VP I&O, CIO.” The same constituency that is the last to know about technology adoption in their organization. Whether the businesses that Forrester surveyed are late to realize the ascendance of open source is, ultimately, academic. 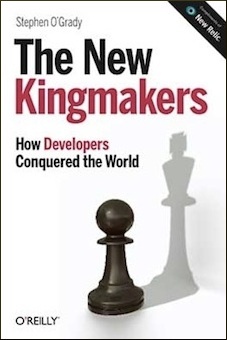 The news here isn’t that the “new king-makers,” as Savio put it, look a lot like the old kingmakers: developers. The news is that management may finally be realizing it. I think it is important to distinguish the type of software that is under consideration. While I agree that base infrastructure that can be deployed via the LAMP stack can easily be controlled at the developer level, I am not sure the same can be said for enterprise applications. I would venture that the functional line of business has a lot more to say about what application is used to solve their problems. While the developer could be an advocate for open source, it is the functional “user” that can actually be the subversive here. Look at how Salesforce.com disrupted the large CRM vendors. The key here for software companies is to distinguish between developers and users, and find the right constituency to bring them in “under the radar”. It still amazes me the number of people that still don’t get open source software is mainstream. Lots of us live in OSS everyday and sometimes forget lots of people still don’t get it. Frankly, we all need to get better at explaining OSS to these types of people so OSS can continued to grow and prosper. I am glad Jeffrey and Forrester are taking up the challenge. @Jeffrey Hammond: I’m not quite sure I’d go so far as to say that it’s 1:1 between those who get and those who don’t, but I take your point. Ignorance – willful or otherwise – persists even today. But candidly, that matters little. Whether or not enterprises are aware of the adoption or not – let alone whether they approve – it is occurring. And will continue to. So while they’re better off getting with the program, and having a more realistic understanding of the way that open source technologies are flowing into their enterprise like water, it won’t make much of a difference either way. Open source will not make up all software in every enterprise, or even most software. But it will make up some of their portfolio: whether they like it or not. @Paula Hunter: I agree, although the context in this case was more general: enterprise adoption of OSS, rather than a more category specific evaluation. To your point, however, it cannot be debated that OSS has had significantly less success penetrating the packaged applications market relative to its traction in the infrastructure. That, coupled with the differentiated decision making and selection that you highlight does indeed lead to differing adoption patterns from category to category. That said, in the big picture sense, open source arrived a long time ago in our view. @Ian Skerrett: Likewise, obviously. Part of the challenge, surprisingly, may lie in the fact that once products become successful, enterprises may actually forget they’re open source. I’ve had numerous conversations with enterprises who claimed to be open source averse, only to subsequently disclose that their datacenters were standardized on RHEL. They had, over time, ceased thinking about it as open source, and internalized a picture of it as just another product. For better and for worse. Of course, you’re right: open source arrived long ago. Of course, Forrester’s right: it’s remarkable how resistant the CIO ranks have been to this (maybe not so remarkable, when you read their journals dedicated to FUD, fear, and futility). Just wanted to make a little comment. At a certain point of the article, you write “Linux is the de facto alternative to Windows on the server and Apple in mobile”. You mention the server and the mobile…. I even Oracle is only an exception. They have all their software available to developers for free download (allowing the quick start to development). Most developers don’t mess with the actual source code (it’s a support issue really unless the open source application is central to the developer’s derived application. Of course, I wouldn’t start with Oracle — why pick an application I know I have to buy if I can defer the support level discussion, but they do address most of the barriers to entry as well as open source, thus their continued success.